The T-8 allows you to wirelessly control anywhere from 1 to 8 clay target throwers. For each trap, you will need to add one R4300 receiver (sold separately below). It is able to launch 8 machines all at the same time. Press the "True Pair" button, press the numbers of the traps you want to fire and press the "True Pair" button again, 2 or all of them. The "Lock On" feature enables repeated throws of up to all 8 machines. A very easy to use 5 Stand or FITASC controller. 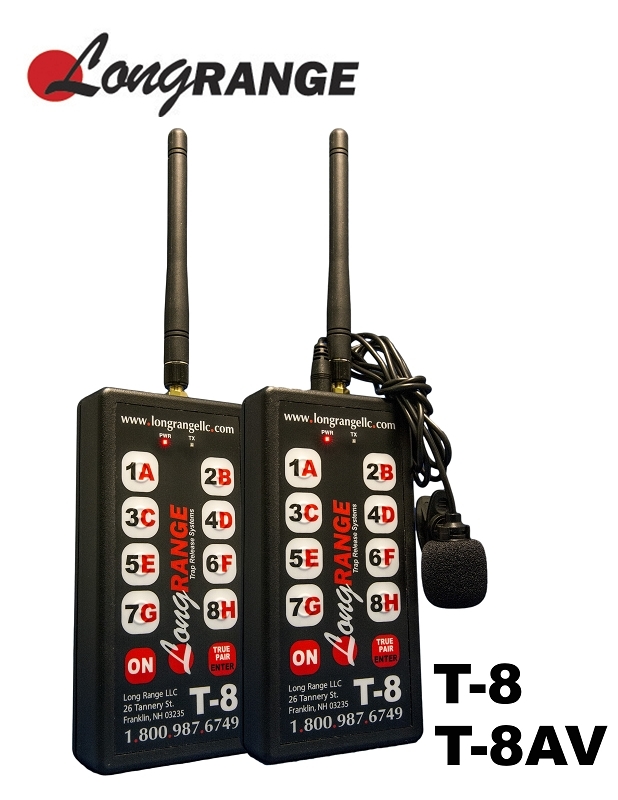 By using the 127 available field/channel settings the T-8 can be used on adjacent stations with no interference. By selecting the "Voice Activated" upgrade below, you are able to launch report pairs and in addition, the unique "Lock On" feature enables you to choose any of the 8 traps and just keep calling for the target. Eliminates the need to keep pressing buttons to arm the unit. The T-8 operates on a single 9 volt battery and has an operating distance in excess of 400 yards.